In other news, I started teacher training today for my summer teaching job with the Institute for Reading Development (aka bootcamp for reading teachers). It’s…long. And redundant. But pays well. And I think the actual classroom experience will be great in the long run. Needless to say, with life being so busy, I haven’t had much time to cook anything interesting, but last week before I left (because one needs sustenance for the road!) I whipped up some of Bee’s Ginger Chocolate Chip Cookies. I made a few changes, but not many, and oh my goodness can I say that these cookies are awesome?! On a first thought, ginger and chocolate don’t seem like the best pair–two very strong flavors. But the end result was perfectly spicy and sweet, rich but not too rich. Plus they’re so wholesome that it feels wrong not to include them as part of my regular diet. Mix together in a large bowl the dry ingredients. Pour in the oil, then using the same measuring cup pour in the molasses (this way the molasses won’t stick to the measuring cup). Add the vanilla and fresh ginger and chocolate chips. Mix everything together with your fingers and slowly add water until the dough forms a ball. Roll a tablespoon or so of the dough into a ball, place on cookie sheet and flatten slightly. Bake for 12-15 minutes, or until golden brown on the bottom. Let cool as long as you can wait! Ginger and Chocolate go so well together. Cookies rock altogether…so this recipe is amazing!!! I love ginger and I love chocolate and I love cookies! glad you liked them. all the best with the grad school. sweet awesomeness i need those cookies, Jess! i think the combination of ginger and chocolate has me so curious i may have to make a batch this weekend! mmmmmm! i’m sorry the teacher training is long and kinda redundant – but that’s pretty sweet that it pays well. very cool on “the ‘noke” having some vegan options – i didn’t know they had a fresh market there! yay! i’m gonna tell my parents ’cause they live in goode and it’s just 25 minutes from roanoke! w00t! Going to give these a try for mother’s day baking treats- though will work it out with a mix of gluten free flours and natural sweeteners instead of the sugar. Yummy! 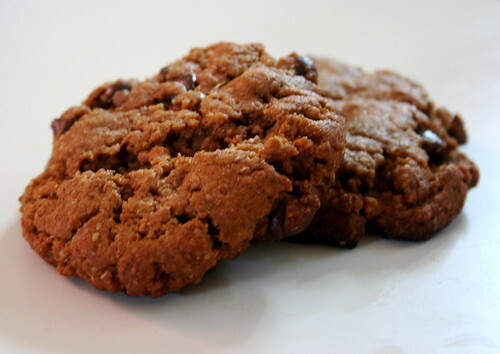 Yum, I love anything with ginger, so these cookies are a must-bake. Yum, chocolate and ginger – these look so good! If you ever feel the need to travel ~45 minutes further south from Roanoke, Blacksburg (home of Virginia Tech) has an excellent vegetarian (vegan options) restaurant with the best “tofu scrambled” in the state. They also have a sister coffee-house (Bollos) that offers excellent vegan baked goods. Best of luck in Roanoke! Ginger and chocolate go so well together, I can only imagine how great these cookies must have been… Sounds like a perfect recipe to save for holiday cookie platters, too! Well, I love chocolate chip cookies, and I love ginger cookies…so I’m thinking these will be right up my alley! those cookies sound great, i love the combination of chocolate and ginger! ginger and chocolate…i never thought of that combo before but i think chocolate goes with anything!